The DeLight Erbium YAG dental laser is a pulsed light that provides pinpoint accuracy to gently remove decay without the need for anesthesia or the drill in most cases. 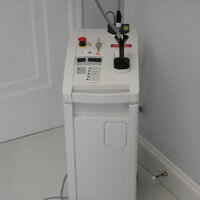 The ErYAG dental laser helps sterilize as it works and is less traumatic to the tooth than the drill. Bond strengths of white fillings to the tooth are also improved by 50% over conventional techniques.